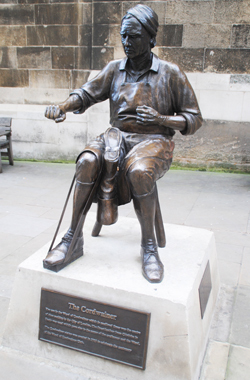 This bronze sculpture, located in Watling Street in the City of London, commemorates Ward of Cordwainer which in medieval times was home to London’s shoe-making industry. The term ‘cordwainer’ relates to a shoemaker who makes shoes from new leather and is derived from the fact that shoe-makers used leather – “cordovan” – from the then Moorish town of Cordoba in Spain (in London this trade was controlled by the Worshipful Company of Cordwainers). The statue, the work of Alma Boyes, was erected in 2002 in celebration of the centenary of the Ward of Cordwainer Club and was a joint initiative of the club and the City Corporation. Initially erected in Bow Churchyard, it was relocated to its present location alongside St Mary Aldermary Church, close to the Queen Victoria Street end of Watling Street, a couple of years later.